Ireland’s only FIA European Rallycross Champion, Derek Tohill, competed in the biggest rallycross event held in Ireland for more than a decade last weekend, as competitors from the Irish Rallycross Championship and MSA British Rallycross Championships came together for a bumper weekend of action at Mondello Park (July 22 – 23). 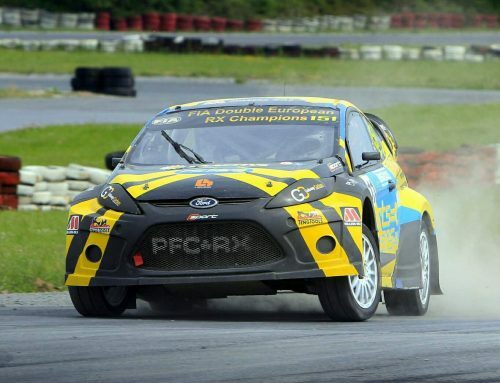 Racing the PFCRX team’s OlsbergsMSE-built Ford Fiesta Supercar, reigning Irish Rallycross Champion Tohill took on the 18-car field on his home circuit and not only challenged regular British RX competitors in the Supercar final to twice finish third, but claimed a pair of Superfinal victories to further extend his lead in the 2017 IRX standings. To combat the popularity of the event, the 600 horsepower Supercars were run in 10-car grids, meaning the action was fast, and in some cases unforgiving, but the PFCRX squad worked hard to keep ‘Molly’ the Fiesta running over the course of the two days, where Tohill ran at the front of the field throughout. The Irishman qualified third in the Intermediate Classification on Saturday and led the first running of the semi-final before the race was red flagged. In the re-start, he finished second to secure a front row start for the final, a race in which on-track battles lost him time and he had to settle for third. To end the opening day of action, Tohill stormed to victory in the Superfinal. 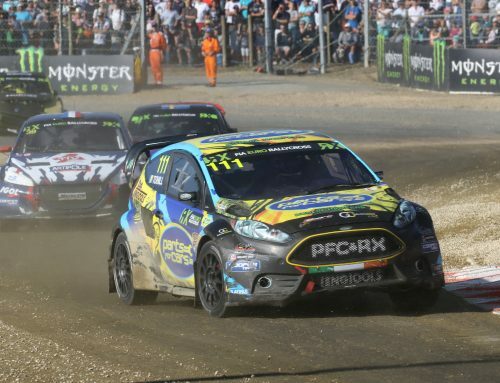 On Sunday, in front of many hundreds of supporters, the team continued to test development parts ahead of the next round of the FIA European Rallycross Championship at Loheac in France in September and Tohill was twice second fastest in the qualifying stages. 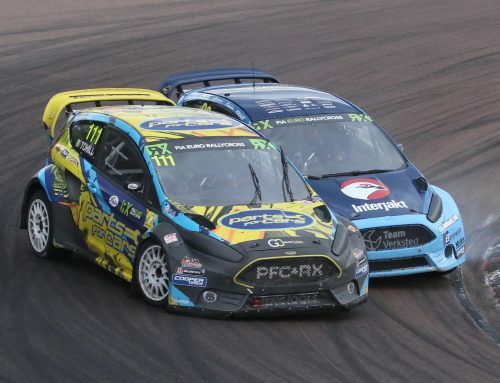 But, due to another red flag in the semi-finals while leading, Tohill’s Fiesta was left on the start line after confusion over the race re-start. He climbed back up the order to make it into the final, where he again finished on the podium following a fantastic start around the outside of the pack at the first corner. The weekend was concluded with a second Superfinal triumph. The Irish team will now re-prepare the Supercar for the next round of Euro RX in France, where Tohill aims to continue his 100% record of qualifying for the semi-finals in 2017, in the ultra-competitive 35-car international field. 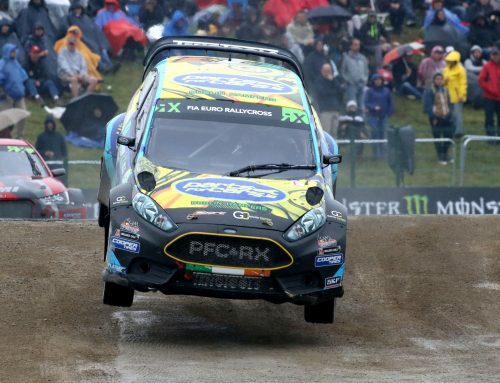 “It was an epic weekend of Irish and British Rallycross and we came away with some really good results. We started from the back row of the grid for the final on Sunday and in the end we were just 1.3 seconds shy of taking overall victory from Julian (Godfrey), who drove superbly all weekend. I cannot thank my crew enough for keeping the car going through thick and thin. Molly is well and truly battle scared; she had more hits than Abba, but that’s rallycross sometimes. I’ve dreamt of competing in my own Supercar at home against such high-level competition for many, many years, and although the weekend was both busy and draining, it was special to be part of. I fought back as hard as I could after the confusion at the re-start in the semi-final on Sunday, but there was nothing left in the car after so much damage. 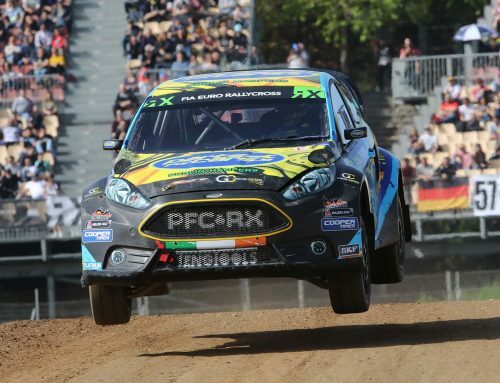 Taking two wins in the Irish Championship leaves us on maximum IRX points, which says a lot for the reliability of the car – we as a team can take great pride in that, but sadly we will miss the next Irish event as it clashes with France. It’s now time now to give Molly lots of love prepare for continuing our good form in Europe. Loheac is a fantastic venue that attracts crowds of almost 100,000 people.